Eid Mubarak to all my friends and readers ! 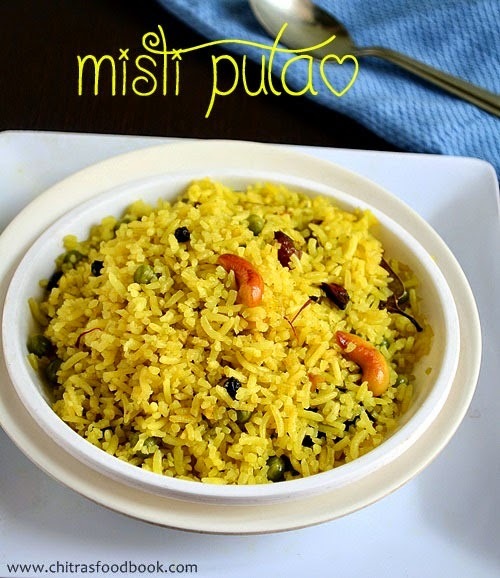 As Ramzan special post,i thought of sharing a sweet recipe with u all.So here comes a delicious Bengali special sweet rice recipe, Misti pulao/sweet pulao.This is a very easy and flavourful traditional Bengali rice recipe.It is also called as “Holud Pulao/Basanti Pulao or yellow pulao”.U can find this dish in most of the Bengali occasions & weddings.When i wanted to prepare Bengali thali,i found that sweet pulao recipe should be present in their authentic lunch menu.So i referred few blogs and finally tried it from Deepasri’s blog.It came out very well.Actually Bengalis use Gobindo bhog,a special fragrant rice variety to make this pulao.U can also substitute with jeera rice or Basmati rice.As i basically love the combination of sweet and spicy taste,i liked this rice very much when i had it with Chanar dalna(yet to post) & Begun bhaja.I read Bengalis have this rice with spicy mutton curry as accompaniment . Mishti pulao recipe – Bengali special sweet rice recipe! Wash and take the rice in a bowl draining the water.Add turmeric powder,mix well and spread the rice in a plate till use. In a broad kadai,heat ghee and saute all the spices given above.Lastly add cashews and dry grapes and fry till the cashews turn golden brown and dry grapes bulge.Then add green peas and rice & saute for few minutes.Do in medium flame.Take care nothing gets burnt.Add sugar & required salt. Now add 1 cup of water.When it comes to boil,mix well and simmer the flame.Cover the kadai with a lid and cook till the rice turns fluffy and soft. Adding green peas is completely optional. U can use jeera rice in place of basmati rice. Adjust the quantity of sugar as per ur tastebuds. Do not fry rice for long time.It makes the rice firm and hard. Enjoy this sweet pulao recipe.It tastes different and yummy !! I had this last weekend at one of my friends house.. I hv taken down recipe from her to try yeah I love it too.. Yours looks so yum! I love this mishti pulao with spicy aloo dum..hmm mouthwatering stuff.